Frontline Tri-Act is an external antiparasitic for small dogs, from 20 to 40 kg, repellent, removes and protects your dog every day of sandflies, mosquitoes, fleas and ticks. Frontline Tri-Act eliminates external parasites in a comprehensive, effective and safe way. (antifeeding) which hinders the contact between dogs and arthropods. 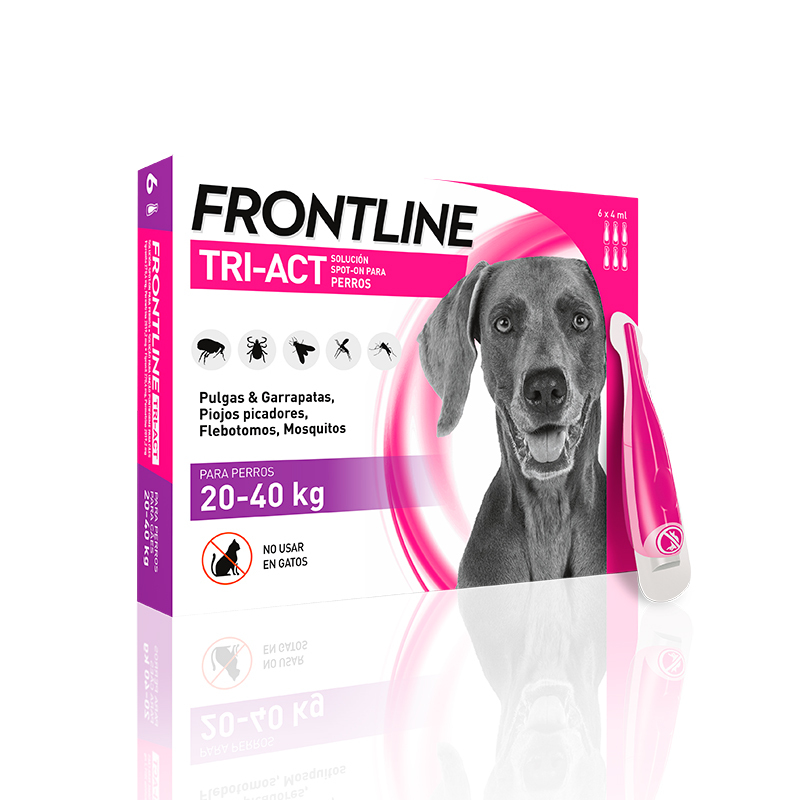 Composition: Tri-Act Frontline Spot-On Solution for Dogs contains 1 ml of product: 270.4 mg fipronil, permethrin 2019.2 mg, and butylated hydroxytoluene (E321) 2.16 mg.
Frontline Tri-Act is effective for the treatment and prevention of infestations by fleas and / or ticks so as to provide a repellent effect against flying insects (mosquitoes, biting flies and sandfly). The triple protective action is characterized by its repellent activity, removal and protection against external parasites. 3 weeks protection against sandflies. 4 weeks of protection from mosquitoes. 4 weeks of protection against ticks. 4 weeks of protection from fleas. 5 weeks protection against stable flies. 1 pipette of the corresponding presentation by weight of the animal. Break the tip of the pipette linia points. Apply the product between the shoulders of the animal (area of ​​the shoulder blades), separate the hair thoroughly until the skin is exposed. Place the tip of the pipette on the skin and squeeze several times to completely empty its contents. Given the properties of the product it quickly begins to spread throughout the skin. Allow to dry and then the pet can be cherished. The product is active for four weeks against fleas and ticks. Treatment against ticks will at least once a month. Frontline the long time is due to the characteristics of the molecule persists long on treated hair. Frontline Tri-Act resists water. Tests carried out have shown that successive baths or shampoos do not alter its effectiveness. However for Frontline Tri-Act is set correctly in the hair and skin, do not bathe the pet two days before and two days after treatment. This is an exclusive product for dogs, whose application in other pets such as cats and rabbits, could lead to serious side effects, even resulting in death. It can cause fatal seizures in cats, being unable to metabolize certain compounds such as permethrin animals. In the absence of specific studies, the use of this product in dogs weighing less than 2 kg or less than 8 weeks of age is not recommended. To avoid exposure to cats, it is recommended to isolate the animal until the product is dry. In case of accidental skin exposure, wash the cat with soap and water. It is important to monitor the cat does not lick the area of ​​application of a treaty dog. If this occurs, seek immediate veterinary advice. Rarely were observed temporary adverse skin reactions at the site of application such as redness, itching, hair loss. If licked by the dog, transient salivation and emesis may appear and reversible neurological signs and vomiting. If pregnant or lactating, the appropriateness of its use should be evaluated by a veterinarian to assess the potential risks for females. Presentations: Box of 6 pipettes. Boehringer Ingelheim Animal Health offers innovative solutions to prevent, treat and cure animal diseases. In any segment in which we compete, our goal is to provide innovative solutions for medical needs not covered. We are driven by the desire to improve animal welfare as an integral part of a healthy future for humanity.